The Rock Parrots or Rock Grass Parakeets (Neophema petrophila) are native to the shores and islands of southern Australia. One of the islands they are seen is Rottnest Island. They are found from Robe, South Australia westwards across coastal South and Western Australia to Shark Bay. They favor rocky islands and coastal dune areas. This small parrot averages 8.4 inches or 21 cm in length. 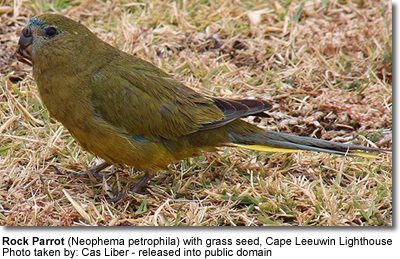 The plumage is predominantly olive green, except for a a dark blue frontal band line above with lighter blue. The lores (the regions between the eyes and bill on the side of a bird's head) and parts of the cheek are pale blue (less extensive in females). The breast is olive-grey (duller in females). The abdomen and vent are yellow. The wings are predominantly olive with outer flight feathers blue. The tail is edged with yellow and the rest of the tail feathers are shades of olive and blue. The bill and legs are grey. The eyes dark brown. The plumage of immature birds is duller, and they lack the frontal bands. They will breed well in any parakeet-sized nesting box, usually twice a year (spring and autumn). An average clutch consists of 4 to 6 eggs. They may produce two, and under optimal conditions, even 3 clutches a year. Pease refer to this website for additional information on care and housing. Rock Parrots eat grass seeds, shrubs and succulent plants.